Hi Roderich, thanks for getting the ball rolling : ) You are quite right about the draw positions. I am considering opening up a topic about the pros and cons of them. On balance I feel they enrich the game enormously, but as you say there is the potential in a tournament for white to refuse to enter into battle at all with the pictured monstrosity I like to call 'The Skulking King'. Crust and I have discussed it at some length, and I think the most compelling solution, if we agree there is a problem, might be a weighted tournament scoring system. To quote Crust from an email "A way of dealing with it in a tournament situation might be to award 4 points for a win, one for a draw and none for a defeat. (instead of the usual 1, 1/2, 0 system) - a draw would still be better than a defeat, but the temptation to go for a win would be greater." I'll leave it to the mathematicians among us to figure out if that would work in reality. Adam wrote: there is the potential in a tournament for white to refuse to enter into battle at all with the pictured monstrosity I like to call 'The Skulking King'. thanks Adam for reminding me of this monstrosity - achieved in 2 moves! I notice that it only works as a draw fort if white keeps the King on the throne, and only moves the piece on f5 to e5 and back. If the King moves, the whole position can be taken apart. I agree it's a monstrosity, but it's quite interesting in its own right! I would prefer to discourage this kind of draw-seeking through a points system, rather than through a rule which prohibits it. However, that would only work in a tournament situation, where points are sought. It wouldn't help when playing a single game outside a tournament. Then, you're just relying on the sense of shame which should normally attach to such bad sportsmanship! However, I would not want to discourage that kind of play which happens when white suddenly abandons assaults on the corners, and switches to trying to achieve a draw position - those games can be great, and getting a draw can feel like a kind of victory under those circumstances. We just want to stop white from going for an easy draw straight away. If anyone can think of a RULE which would prevent white just going for a draw straight away, without affecting the formation of draws later on in the game, I'd like to consider it! Naturally, WE are far too honourable to indulge in frivolous draw-seeking, but we might find ourselves up against less scrupulous opponents in future... and this issue has the potential to spoil a tournament if we're not careful. Thanks Roderich for your brilliant work on Fetlar results, if you don't mind I would like to forward your analysis to Peter Kelly in Shetland. It might cheer him up. Hello Beadle really good to have your contribution as well. You are probably right about 4:1:0 being too extreme, I think I used the 3:1:0 points system in Yorkshire, and it worked well, though the players were all relative beginners and maybe didn't suspect they could get a draw so easily (because I didn't tell them..) Possibly if they were all grand masters, they would need more threats to make them behave! Crust and I have done a small draw fort test where white only tries to build a fort, while black attempts to prevent it. Initial results suggest it is surprisingly hard for white if black are determined, though it is challenging for black not to compromise their defensive positions should the king make a break for the corners. This is of course a crucial part of siege warfare, breaking in verses breaking out. Crust and I will continue to experiment to see if white is 100% able to force an opening draw and report back with results. Greetings all! 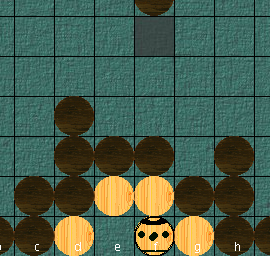 This post is about draws in fetlar hnefatafl. It repeats some things already discussed - apologies for that. Just summarizing my thoughts on the subject. Thanks to Chuck Ward for setting me off again. Basically, white can in fact create a draw position in 2 moves, and there seems little black can do about it. This is what Adam calls "The Monstrosity". How to get a draw fort in 2 moves. Black can pick off h6 and f8 but it makes no difference. White must only move the e6 piece after this - moving the king would expose g6 and f7 to capture. But can black prevent the formation of this position, by blocking the second move? e.g 1: h1 - h3, e5 - e4. 2: d1 - d5? This can be captured, but it disrupts the position a little. Possible continuation: 2: ...e4 - d4x. 3: e1 - e4? I had a whole series of games like this with Adam, to test out the idea, and I think the jury?s still out. We accidentally invented a new game in the process - you could call it "draw hnefatafl" - whoever plays white has to go for a draw at the earliest possible opportunity. If white gets a draw, white wins. Sometimes white got a draw, sometimes not. Sometimes black lost so many men trying to stop the draw fort that white could easily win properly, that is, by getting the king to the corner. Anyway, even though the draw fort was sometimes stopped, neither of us could confidently assert that it could always be stopped - too many variables in the moves and responses. However, it's possible that these early draws can be stopped by black offensive countermeasures. Another way is using points. In a tournament you can award zero points for a draw, zero for a defeat and one point for a win, so a player could not win a tournament by always playing for draws as white, against another player who risked losing in order to get an occasional win. A player with six draws would have zero points, but a player with 1 win and 5 defeats would have 1 point. A draw would still be worth fighting for though, because at least you'd be depriving the other player of a point too. I think this is an excellent idea for tournaments. However, outside of a tournament situation, (e.g. when playing a single game) it's no help. Another possible solution is to ban centre forts, while still allowing edge forts. Then you preserve the kind of game which flips from one mode (attacking the corners) to another mode (forming a draw-fort) and back, which I think adds a fascinating dimension to the game, but you would avoid the possibility of an early centre-fort draw such as the "monstrosity". I don't know practically how this would work, after all, white may form a centre fort "accidentally" while retreating towards the centre - would black then claim an instant win, or demand that white makes an alternative move? I see problems there. Perhaps the rules would have to be amended to say that black wins after 2 move repetitions if during those repetitions the white king is on the throne square, or moving to and from the throne square. There's probably a more logical way of putting it, but it sounds rather inelegant. It's not a step I would take gladly, because I have had several good games featuring battles in the centre, where one player is trying to create a centre fort and the other is trying to stop it. But maybe it is a necessary adjustment, especially if we begin to find that early draws happen a lot, though actually at the moment they're pretty rare. I would say most players at some stage discover this possibility of an early draw, try it out, and quickly realise it spoils the game, so they stop doing it. The fetlar rules give white a fair chance of winning (and black too of course), but I suppose there's the chance that a weak player who knows he is up against a stronger player might be tempted to score a draw rather than play to win. So, in conclusion, I'm not even sure if this is a real problem, or an imaginary one. (Sorry for wasting your time!) If it is real, I think there are solutions to it. 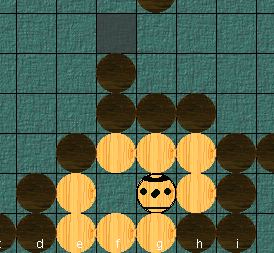 I should also have mentioned Berserk Hnefatafl, which addresses the same problem in a brilliantly creative way. Another solution is to play Rachunek Tafl, or any of the 9x9 variants where draw forts don't occur. That will suit some players, but not others. I'd love to know what the Vikings did about this (assuming their rules were anything like ours...) I suspect a good old-fashioned axe in the head might have sorted it out. Adam wrote: I have had a number of cracking games cut short over on dragonsheels. 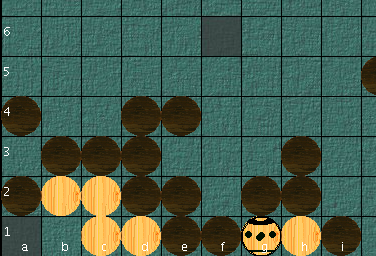 I've adjusted my play to work harder at preventing draws, but the point is that if black plays a strong opening game white scurries back into his hole without making a serious attempt at escaping. This leads to black having to over extend in order to start picking of kings men as early as possible, which in turn leads to white gaining more escape opportunities. On the face of it, it sounds like more dynamic excitement on the tafl board. But look deeper, and what you have is the kings side gaining advantage through potential early draw threat, forcing black to play dangerously right from the start. Which is fine, if we like our draw forts (and I do), but it suggests to me black needs some help to restore the balance. Or the king needs handicapping further. This would also potentially satisfy the perpetual check problem. Again, I like the challenge as black trying to prevent these situations appearing, but as this puts such a pressure on black, some kind of king handicap might be in order. All the talk of this not happening in tournament situations and being good sports doesn't really convince me as playing as xonn i've run into several early draws on dragonheels in tournaments perhaps because its rewarded with .5 points. So, my feeling is we either implement a rule that forbids repetition, or we find a way of restoring the balance. I think that Adam with this reasoning in a clear way proves that the draw option when abused will inevitably spoil a good game. crust wrote: I don't see anything wrong in using the threat of a draw in the mid-game to get some leverage over black, especially after black has completed the encirclement - I mean, what else is there for white to do, apart from waiting to die? On the other hand, a complete lack of a draw option will no less spoil a good game. That white is completely encircled halfway through a game is a very usual situation, but it will still take the other half a game to cautiously enough complete the capture, even when the outcome is the certain white loss, without the draw opportunity. conanlibrarian wrote: I suspect that 11x11 edge tafl is as "susceptible" as Fetlar to draw forts (any experience from 11x11 Rachunek?). In the 11x11 Rachunek game, the simplest center fort is also the one shown above, using 8 of the 12 white pieces. Building it would require six moves, and most possibly be difficult to do undisturbed. Now to the 11x11 Hnefatafl variants (Fetlar and Scandinavian Museums). It's not easy to differentiate between "good" and "bad" forts. The two-moves-game Monstrosity fort is of course a bad fort, that's easy. But what if white moves around at random for some time, all the time sticking close to a draw-fort position, only to after a suitable long time close the game with a fort? How could any game rule draw the line between "good" and "bad"? If some rule is to be added or modified, concerning the draw-forts, it should be a simple one. Like "When the king reaches a corner square, white wins"; that simple. I think a solution is to be found in the fort shown above. Why is it possible to abuse the draw-fort in Fetlar, but probably not in the 11x11 Rachunek? I'd say that it's because it's fairly easy to build the center fort in Fetlar - just takes 5 pieces. Whereas the fort above takes 8 pieces out of 12. And what makes these two variants differ? - of course that the king in Fetlar is allowed to return to the throne, thus making the simple fort possible, whereas in Rachunek he cannot return to the throne, thus making the center fort complicated. (w=white, k=king, e=empty, th=throne), still using 8 white pieces out of 12, good luck with that. Therefore I'd suggest that we try and add the rule to Fetlar that the king cannot return to the throne once he left it. Oh and one more thing: if the king never leaves his throne, he looses. That will take care of the two-moves Monstrosity game! With this addition maybe 0.5 point can again safely be given for the well deserved draw without risk of abuse. I'm sorry, crust, it looks like the reasoning above was a bit too fast. I did some test games as white against the computer and was able to lure it with a Monstreus center fort without re-entering the throne, i.e. I built the center fort first thing start of the game, using many moves and all 12 white pieces, and although the computer plays rather aggressively it didn't stop it. Before any decision about a rules change, maybe crust and Adam should try a new test series with the new rule, where white tries to immediately build a center fort and black stops it. The center fort in the diagram is quite easy to do against the computer. 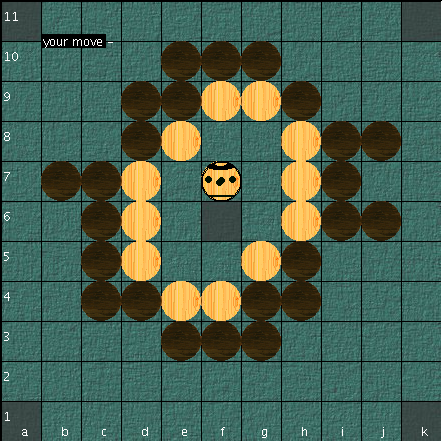 Since white built the fort immediately without any fighting, it's also easy for black to completely encircle the construction as no black pieces are lost. If the real goal in the game for the king is to escape to the periphery of the board, this diagram intuitively looks like a white loss. These rules do not forbid some forts and others not. But if black hasn't enough pieces to encircle white, then I suppose that black can't seal off the corners neither, and so white wins instead of building a fort. This is why the center fort disappears. Also the encirclement rule correlates to the Fetlar edge rule: The Fetlar edge rule states that the king cannot be captured on the edge; and neither then can the white pieces be encircled on the edge. Which preserves the edge fort option. With the suggested encirclement rule, a white draw fort cannot exist within a black encirclement. The long game phase where black after encirclement moves in and slowly strangles the white side can therefore be canceled, as the justification for this phase was the race for a center fort. Without a center fort option, white lost the moment the encirclement was completed. 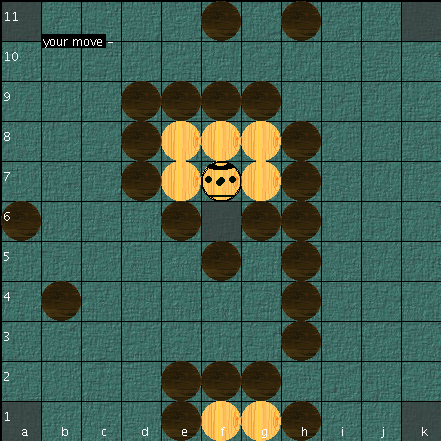 crust wrote: ... white may as well try to break out and seize control of a corner, and then go for a draw [a center fort] if that fails, and black manages to complete the encirclement. The interesting part comes when black realises that white has started to do this, and must work out how to stop it - often black will have to risk exposing a corner in order to prevent white from achieving the draw position. If that happens, white may have another chance at a win. So white is using the threat of a draw to disturb black's position, and thus create chances for a win. Without a center fort option, the edge fort becomes even more important and takes over the function of the center fort threat. When black has sealed off the corners, it's usually only a formality to complete the encirclement. The only white chance in this phase is then the edge fort - an even more efficient threat if a completed edge fort means a white win. White is not completely encircled and this would actually be a draw with a center fort? Last edited by Hagbard on Fri Mar 24, 2017 8:05 am, edited 1 time in total. Thanks Hagbard for your interesting research. You could call it a "double monstrosity" as it is just two monstrosities back-to-back. The proposed rule that the King must leave the throne and may not return would not make any difference - white would still have an early draw. Actually matematician had this position in a game against me on dragonheelslair. So: I agree that making the throne non-re-enterable does not rule out early draws through centre fort building. It rules out the monstrosity, but not the double monstrosity. This will need testing in real games, I hope I can arrange something with Adam soon. crust wrote: The proposed rule that the King must leave the throne and may not return would not make any difference - white would still have an early draw. The throne modification idea is off; I think that crust's 5-moves Double Monstrosity game example is a fine proof of that. I can go with that; "Copenhagen Hnefatafl 11x11". More on the edge forts. The king is on the edge all right and cannot be captured, but the situation is very close to "just reach the edge and win", which I believe is established to be too easy for an armed, powerful capture-from-4-sides king. So this should be a draw as in Fetlar. A distinguishing characteristic of this "fort" is that the king cannot move. To rule out this kind of "fort" it could be a requirement for a white win that the king can move. 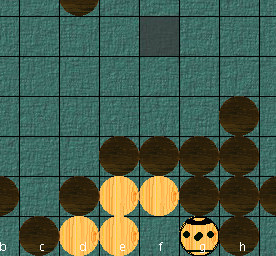 The king is on the edge and can move back and forth on the edge, untouchable by black. I'd suggest that this is promoted to be a white win. ("If the king can go along the ---line that side wins the game"). I'd suggest those to remain draws as in Fetlar. The edge fort thing is an experiment. The White Win edge fort would give white the option to attack and win on the whole periphery - corners and edge lines; and if the attack fails, white could win at least a draw. Perhaps such attacks can disturb black's work sealing off corners. Though I'm not sure of the real importance of the threat; I believe we experienced that it's in fact very difficult to build an edge fort. There could for now be a Copenhagen test button, in real the same as Fetlar, but pressing the button means that you agree to give up / offer draw after the Copenhagen test rules. Not to forget that there is the very simple alternative solution to the "early draw problem" that white always looses if he doesn't win, so that any game where white doesn't reach a corner is a white loss (one of the suggestions by conanlibrarian above). Not that it would change the balance radically. Roderich's analysis 2011.08.20 and mine 2012.01.30 both gave 44% white wins, 39% black wins and 17% draws. With all draws turned into black wins this would become 44% white wins and 56% black wins. But many nuances of the game would be lost with it, and I think that the feinschmeckers would note the lack.